This is a part of a large project entitled ‘Refracted Colonial Modernity’ led by Kikuchi and funded by the Chiang Ching-Kuo Foundation (US$55,100) since 2000. Outcomes produced by this project include a panel at the Association for Asian Studies conference in San Diego (2000), an international conference ‘Refracted Colonial Modernity in Art and Design of Taiwan’at the National Museum of History, Taipei (2001), an invited talk by the National Culture Association and the Taiwan Historical Association on ‘From Representation to Subjectivity: Taiwanese ‘Vernacular’ Crafts’at the International Conference on History and Culture of Taiwan (2006), a travelling exhibition ‘Refraction and Creation: Modernity and Identity in Taiwanese Crafts’ at the National Taiwan Museum (September-November 2008) and Brunei Gallery, SOAS (January-March 2009), as well as the publication of this volume. 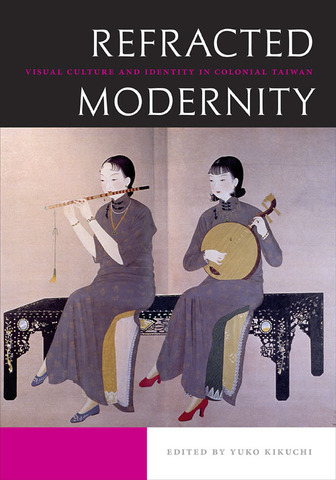 This volume presents critical studies of modern Taiwanese art—a new academic field with still very few publications in English. Its originality lies in the treatment of Taiwanese art as a field independent from Chinese art, and through its focus on postcolonial analysis. Because Taiwan’s case is unique due to colonization by a non-western country—Japan, Taiwan adds different dimensions and complexities to current studies on colonialism in relation to modernity, which have been established primarily on the model of Euroamerican colonies. The nine papers in this volume present different perspectives of Taiwanese visual culture and landscape during the Japanese colonial period (1895-1945) through the media of travel writings, paintings, architecture, material culture and crafts. The central theme is ‘refracted modernity’, whereby the term ‘refraction,’ describes metaphorically the recursive and transferable nature of modernity. We argue that the formation of modernity and identity in Taiwanese visual culture involves a range of interdependent cultural transfers and appropriations between Europe, Japan and Taiwan, and subsequently produced a fascinating ‘hybrid’ visual culture in Taiwan. Kikuchi served as editor for the volume and contributed the introduction and well as the essay Refracted Colonial Modernity: Vernacularism in the Development of Modern Taiwanese Crafts.